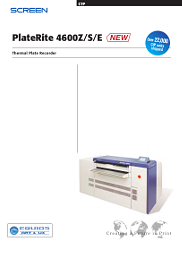 PlateRite 4600Z/S/E | SCREEN Graphic Solutions Co., Ltd. Accurate reproduction of halftone dots with proprietary developed exposure headsTo ensure more stable exposure, the light source is equipped with the same proven fiber laser diodes used in the PlateRite 8600 series. The resulting changes in the laser beam have improved the balance of vertical and horizontal lines, enabling sharper reproduction of halftone dots. This has led to a major increase in overall print quality. 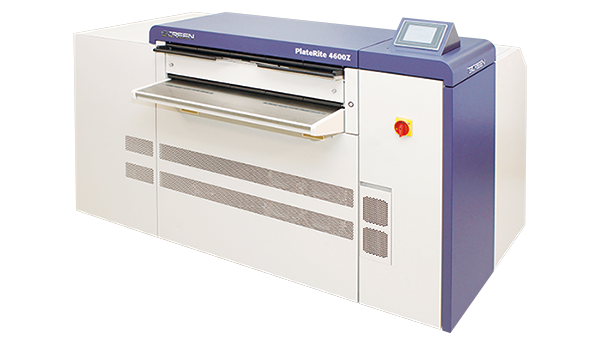 Autoloader maximizes productivityAn autoloader system can be installed to automate all processes from plate loading through exposure, transport and developing to discharge. The autoloader supports extended periods of continuous operation and significantly increases both productivity and press operating ratios. 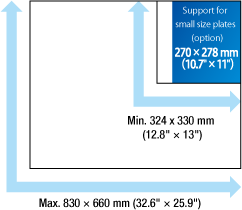 The newly available small size option supports minimum plate size of 270 × 278 mm (10.7" × 11"). This option provides increased flexibility when using letterpress systems.